That was the initial reaction to Apple Music from Daniel Ek, CEO of Spotify. (He deleted the tweet soon after posting it). It's a fun jab from a competitor, but streaming music incumbents shouldn't take Apple's new re-branded music offering lightly. Few would argue that Apple Music will be as groundbreaking iTunes. But Apple (AAPL) is in a unique position to go toe-to-toe with Spotify, the subscription streaming leader. Apple has a three-part plan to disrupt the streaming music space: Music, Radio, and Connect. Music. The core Apple Music feature is basically a re-branded version of Beats Music, which Apple purchased for $3 billion last year. Just like Spotify, it allows you to stream any track on-demand for a $9.99 monthly subscription fee. Although not every song in the iTunes store will be available to stream, Apple has said that "tens of millions" of songs will be there at launch. One notable exception is The Beatles, whose catalog is not currently available on any streaming platform. So what makes this more enticing than Spotify? Apple has two key advantages. First, the service will automatically be installed on all iPhones, iPads, and Macs, starting on June 30. An Apple customer is a lot more likely to stumble upon a service already on his or her phone than one that needs to be actively downloaded from the App Store. Second, and more importantly, Apple Music allows you to include your existing iTunes library in your playlists. Music lovers bought more than a billion digital songs last year, according to Nielsen, so clearly iTunes remains a huge selling point for Apple. Radio. Apple will continue to operate its iTunes Radio service as part of Apple Music, even though it hasn't been widely adopted. It's basically a Pandora (P) competitor, allowing you to create a "station" based on an artist, song, or genre. But Apple Music also comes with an exciting, innovative new feature: Beats1, Apple's new 24/7 live radio station. It will be hosted by superstar BBC Radio 1 DJ Zane Lowe (and other hosts he handpicked). Fans of Lowe know that he is seen as a tastemaker who often brings music to the world well before it reaches the American Top 40. 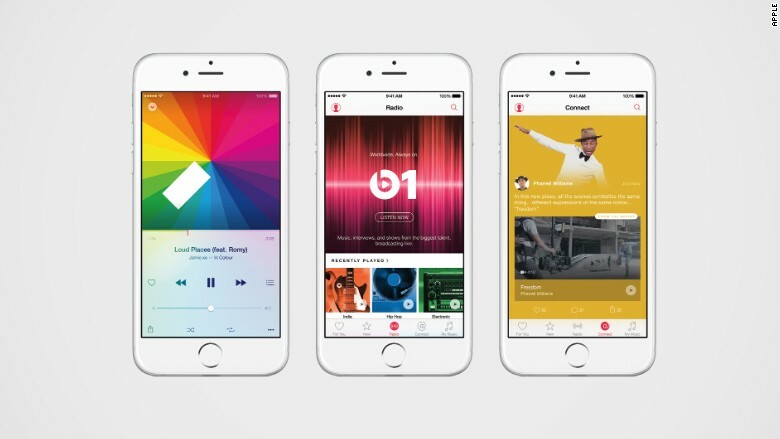 If successful, Beats1 could allow Apple to play a real role in shaping listening trends. Connect. Essentially a social network for artists, Connect will allow musicians to create pages where they can share songs, videos and messages directly with fans. It sounds a lot like Ping -- Apple's disastrous attempt at integrating music and social back in 2010. Can Connect succeed where Ping failed? Being able to reach fans in the same place they are already listening is a unique opportunity. But it is really dependent on Apple Music as a whole gaining some traction. Artists won't be convinced to embrace yet another platform unless there's a whole lot of people there to reach. 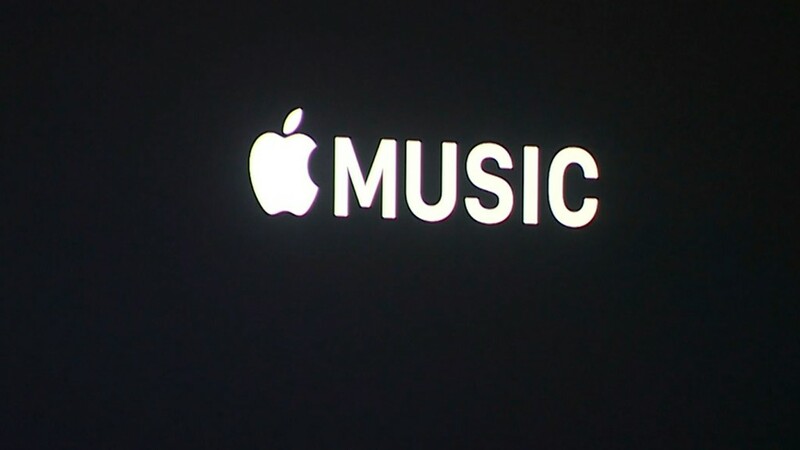 So can Apple succeed in streaming music, a business it has entered so late? Spotify has quite the head start. It announced Wednesday that it has more than 20 million paid subscribers (and 55 million more who use the free version of Spotify). But the iTunes Store has hundreds of millions of accounts with credit cards. If Apple can convert only a small fraction of those users to subscribers, it might be able to catch up. Apple has entered many existing markets -- including the MP3 player or the smartphone spaces -- and completely turned them on their head. But in this case, if Apple succeeds it won't be because Apple Music is revolutionary -- it's really not that different than what's come before. Apple is banking on being able to easily convert existing iTunes and iPhone users. That's a huge amount of people. And it might just give Apple the momentum it needs.